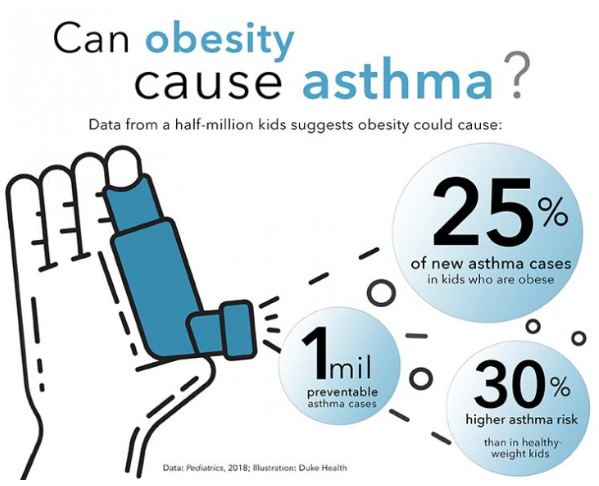 26 Nov 2018 --- One million cases of childhood asthma could be directly attributable to obesity, a study utilizing big data for pediatric research has found. Led by Nemours Children's Health System, the research highlights the need to prioritize addressing childhood obesity as it appears to be one of the few preventable risk factors for pediatric asthma. “Pediatric asthma is among the most prevalent childhood conditions and comes at a high cost to patients, families and the greater health system. There are few preventable risk factors to reduce the incidence of asthma, but our data show that reducing the onset of childhood obesity could significantly lower the public health burden of asthma,” says Terri Finkel, Ph.D., Chief Scientific Officer at Nemours Children's Hospital in Orlando. In the analysis involving 507,496 children, the researchers reviewed data of patients aged two to 17 without a history of asthma, receiving care between 2009 and 2015. Overweight or obese patients were matched with normal weight patients of the same age, gender, race, ethnicity, insurance type and location of care. Click to EnlargeObesity may be the only risk factor for childhood asthma that could be preventable. Credit: Duke Health. The incidence of asthma diagnosis among obese children was significantly higher than in children in a healthy weight range, with about a quarter (23 to 27) percent of new asthma cases in children with obesity being directly attributable to obesity. With 6 to 8 million cases of pediatric asthma previously reported in the US, this data suggest that 1 million cases of asthma in children might be directly attributable to obesity and that at least 10 percent of all US cases of pediatric asthma might be avoided in the absence of childhood overweight and obesity. Additionally, obesity among children with asthma appears to increase the severity of the disease. Being overweight was identified as a modest risk factor for asthma and the association was diminished when the most stringent definition of asthma was used. Other significant risk factors of an asthma diagnosis included being male, aged under five years and being African-American. “Asthma is the number one chronic disease in children and some of the causes such as genetics and viral infections during childhood are things we can't prevent,” says Jason E. Lang, M.D., Associate Professor of Pediatrics at Duke and the study's lead author. “It appears becoming obese as a child significantly increases your risk of developing asthma, and it's a significant increase, directing attention again to the importance of preventing obesity at an early age,” adds Lang. “The most surprising thing was that the risk is not nearly as significant in overweight children. We expected to see a more profound increase in the risk of asthma with these children, too. This holds implications for counseling kids and families regarding incremental weight loss and possible prevention or improvement of asthma,” Finkel tells NutritionInsight. The data were entered into a clinical research data network called PEDSnet between 2009 and 2015. The research team hopes in the future to use PEDSnet’s capabilities to gain new epidemiologic insights into the relationship between pediatric obesity and asthma, including measures of lung function, comorbidity and medication data. Each PEDSnet member institution can map its data onto the common data model, creating an enormous resource across the network with the power to produce findings relatively quickly. “The PEDSnet collaboration brings the power of Big Data to pediatric research and medicine – as well as the expertise to structure the data and understand how to extract the most meaningful points,” concludes Finkel. Obesity rates are rising globally and have induced fears surrounding the impact on metabolic syndromes such as diabetes and a potential insulin shortage facing sufferers in the future. The growing incidences of obesity have also led to an increase in bariatric surgeries for weight-loss as well as diabetes management. This, however, has worried some experts in the field.